The Keweenaw Shores No. 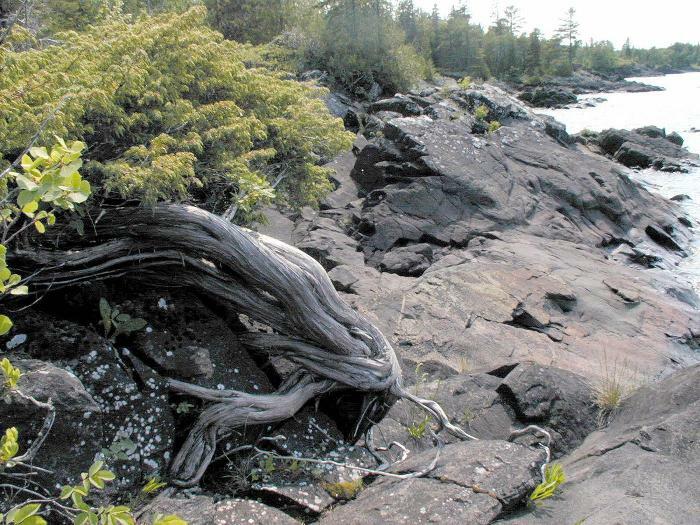 1 Nature Sanctuary protects habitat stretching from the rocky shores of Lake Superior to Brockway Mountain Drive, where it connects to MNA’s Upson Lake Nature Sanctuary. Along the shore of Lake Superior, there is a spectacular array of rocks covered with colorful lichens ranging from pink to orange, yellow and green. A natural cove along the shore is one of the few places in Michigan where it is possible to see both a sunrise and sunset without visual distraction. South of M-26 by the trailhead, look for bearberry pipsissewa, Douglas haw, and mountain alder. In late spring, the showy white blossoms of the serviceberry, the earliest blooming shrub in the Keweenaw, greets the hiker, followed by tasty serviceberries by mid-summer. The trail winds over several ridges of Copper Harbor Conglomerate and traverses four different plant communities. The boreal forest is comprised of white spruce, balsam fir and aspen. Many bird species, including ruby-throated hummingbirds, boreal chickadees and American redstarts build their nests in the lichens. These lichens are part of a mutually beneficial, symbiotic relationship between a fungus and another organism, in this case green algae or cyanobacterian, which results in the production of food by photosynthesis. Lichens of the genus Usnea are among the organisms most sensitive to airborne pollutants, especially sulfur dioxide, making them especially valuable as natural indicators of air quality. The conifer swamp area is found just past three ridges. This area is small and contains white cedar and moss-covered ground cover. Beyond the swamp is another rocky ridge containing a dry northern forest, which includes white pine, red oak and bracken fern. The rocks of the northern shore are more than 1 billion years old. Black lava rocks form the outcrop by Esrey Park and reddish sediments from conglomerates and sandstones form ridges and valleys as the trail traverses and dips to the south toward the basin enclosing the lake. The best time to visit the sanctuary is during the spring during migration. From Eagle Harbor follow M-26 northeast about six miles to the Esrey Park roadside picnic area along Lake Superior. Visitors may park at Esrey Park or along the south side of M-26 at the MNA sanctuary trailhead sign.